How dare they even try and report such a thing? Why hide that ISIS claimed responsibility? 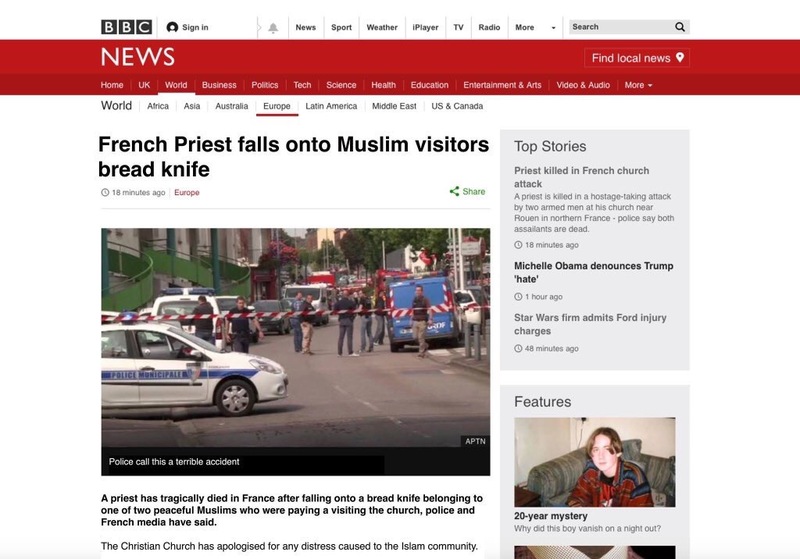 Several witnesses, including a nun have come out and said that the killer made the priest get on his knees before slicing his throat. This kind of stuff just really angers me. Maybe you haven’t heard .they have decided to ‘bury’ ISIS attacks in matters such as these….. only the stupid sheeple will believe the deceit…. too bad there are so many of them… sheeple,I mean. Everything is ‘just fine’..everything is GREAT!…. what’s the matter with YOU?! Don’t you see it? You must’ve taken the wrong pill……..
What ever happened to Islam being set up by the Pope, and they were only supposed to kill untrue Christians and Jews and leave the Roman Catholics alone?